Customise SalesSeek to suit your sales workflow. 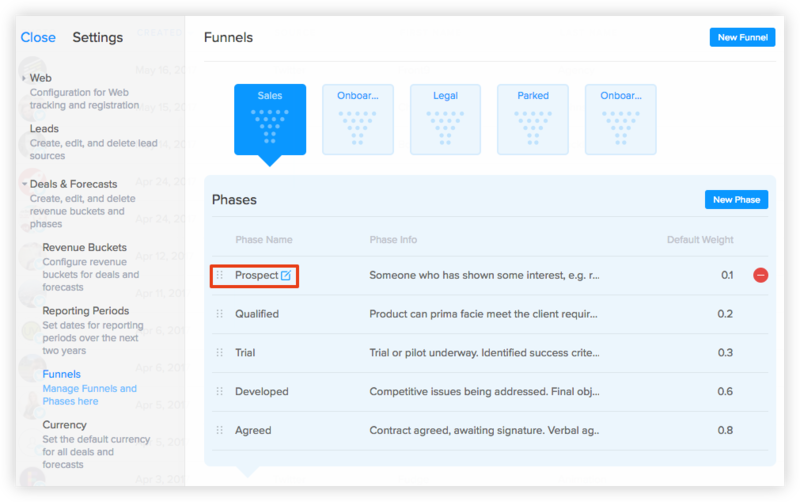 If you're unsure what to set your Funnel Phases to, this blog post may help. To edit an existing phase, hover over the phase and click the edit icon. You can edit the Name, Info and Default Weight using this method. You can also re-order the phases by grabbing the handle to the left of each phase. Name - This is name displayed in the Funnel on the Dashboard and Deals section. Phase Info - This information will be displayed upon hovering over the phase name in the funnel. This is to provide users with more information about the criteria for a deal to be moved to this phase. Order is the order which they appear in the Dashboard and Deals section. You can also create new phases by clicking on the New Phase button in the top right hand corner of the window. To delete a phase, hover over the phase and click the delete button to the right. Note: You will not be able to delete a phase that contains existing deals. You will need to delete or move these deals before deleting the phase. You can rename the phase.